Microsoft Direct X is the collection of APIs for handling graphics and multimedia related tasks especially for gaming on Windows. It includes Direct3D, DirectDraw, DirectMusic, DirectPlay, DirectSound, and others. If you are facing graphics related problem in running a game, the problem may be related with DirectX. Many new games do not work properly if you are using old version of DirectX. So checking the current installed version of DirectX and then upgrading it to latest version may help. To check the current installed version of DirextX in your system, click on “start” menu and then select “Run”. You can also press “Windows Key”+”R” keyboard shortcut to open run dialog. 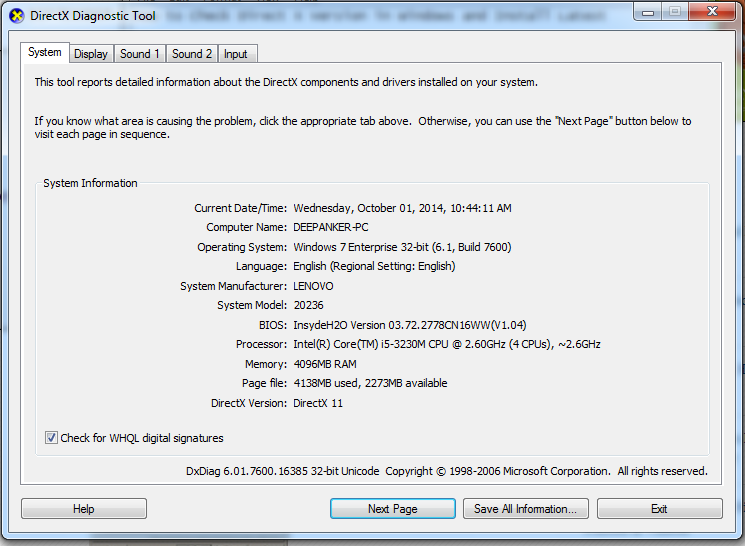 In run dialog, type “dxdiag” without quote and then click ok. You will see the window of DirextX Diagnostic tool. In the system tab, see under System Information section. You will find the DirextX version number. If you have enabled the automatic updates, Microsoft will update your software including DirectX automatically when the update is available for your system. But this is not the case if you have disabled the automatic updates. You will have to update software and drivers manually. If your system has older version of DirextX, you can update it by downloading platform updates for your operating systems. You can also use this Link to search for directX and download the installer.